All supplies are Stampin' Up: Springtime Vintage and Elegant Soiree designer papers with Night Of Navy and Whisper White cardstocks. Baja seam binding ribbon and antique brads with Hearts embosslits and heart punch also used. This card is for our Three Amigas challenge to make a non-traditional valentine with no red or pink. For Mojo177 sketch layout also. Beautiful card! Thanks for playing with us. Such a pretty way to show all of those great papers. 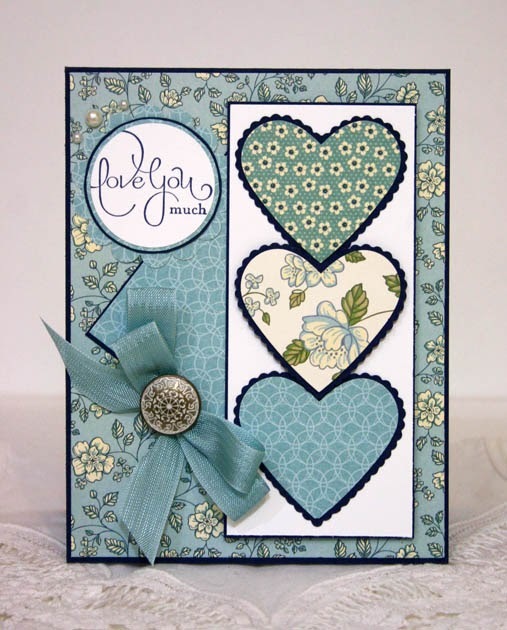 Love the blues and the pretty stacked hearts Joanne! OOOO Joanne what a GORGEOUS design, I LOVE the blues and black!! Sooo elegant! Beautiful in blue! Love it! FANTASTIC take on the Mojo sketch. Love the color combo as well! BEAUTIFUL !!! 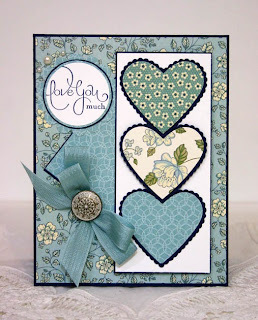 Love this card & all the supplies you used ... I just got that pack of paper from SU & now can't wait to tear into it ... LOVE the hearts & how you designed this great little creation !!! This is BEAUTIFUL!! WOW...this is soooooo pretty...I love it all! Will look for this on SCS, needs to go into my favs!! Another beauty in the co-ordination of papers J... the hearts are just fabby! Oh Wow, I just had to comment on this one too!!! This is beautiful. What an attention getter. I love the color and layout on this. Pure paper perfection. Love it. Beautiful card, Joanne! Love the trio of hearts! 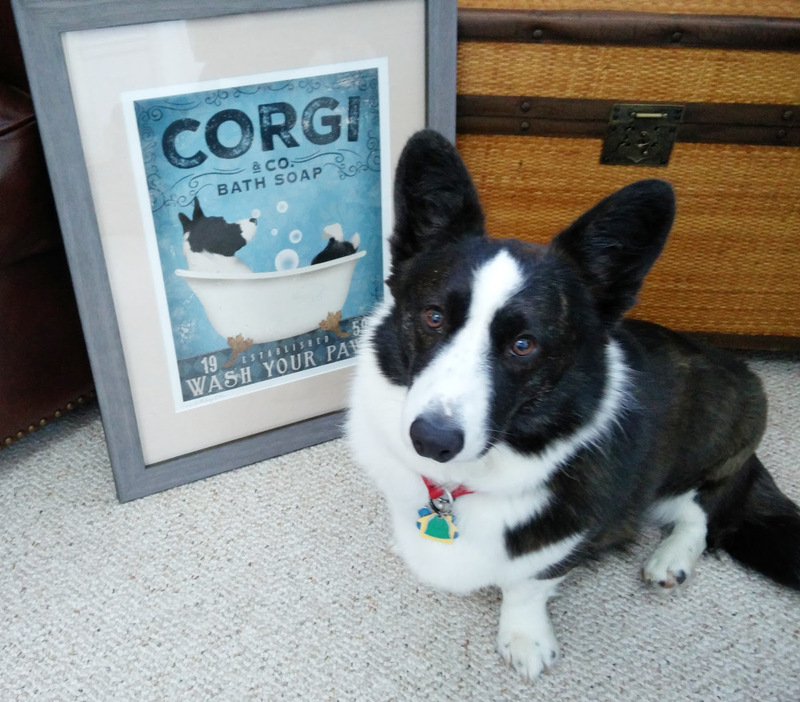 Thanks for playing along with Mojo this week! Cute, cute, cute!!!!!! Can I CASE you? I love this card! Those stacked hearts are wonderful and they show off our beautiful DP so well. Love it! Gorgeous, love the hearts & the different dp!